The first picture of the Amazon Kindle Fire 2? The Optimus G is LG’s Android flagship smartphone to be. Highlight is the 13,0 mega pixel camera that is supposed to outshine all other smartphone cameras. But there is more: the LG Optimus G will feature a stunning Snapdragon S4 Pro Quad Core Processor as well as a 4,7 inch display with 1280×720 resolution. Moreover, the smartphone is 0,85 cm thick. 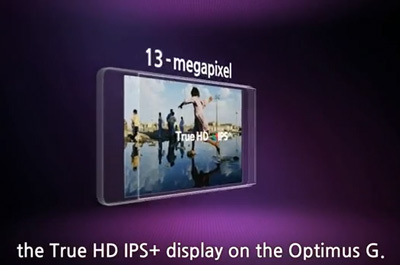 However, the smartphone’s 13,0 mega pixel camera will be the icing on the cake, no doubt. It is therefore no surprise that LG released a teaser video on its own YouTube channel, which puts a particular focus on the quality of this very impressive camera. 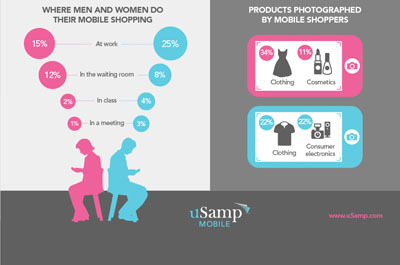 According to a recent study carried out by US market research institute uSamp, men do more shopping on their smartphone than women. 1.100 men and women from 18 to 75 years of age participated in the study. Whereas the percentage of female online clients was at 34%, male purchasers were seen in 45% out of all times. The study furthermore claims that 25% of men do mobile internet shopping during working hours. Yet, 12% of women use the time sitting in the doctor’s waiting room to do their shopping. 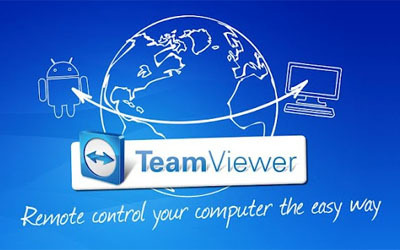 Today, Teamviewer released a new updated version of its known app. Teamviewer 7 allows you to transfer data as well as files from your PC or Mac to an Android device and vice versa. You can establish a protected far-reaching connection to your PC or Mac and have instant access to it. This makes it possible to quickly help friends or colleagues with computer problems. Furthermore, the free of charge app made for private use allows you to instantly retrieve data from your PC or Mac. This is particularly useful for people who are moving around all the time. They simply use their Android smartphone or tablet to get hold of that very important document on their home computer. Of course the app also becomes handy when you want to load music or pictures onto your smartphone without having to use a usb cable. We are currently receiving exciting Android news from the IFA in Berlin every day but new developments are happening in other parts of the world as well. For example, it looks like Amazon has sold its whole stock of Amazon Kindle Fire in the US. 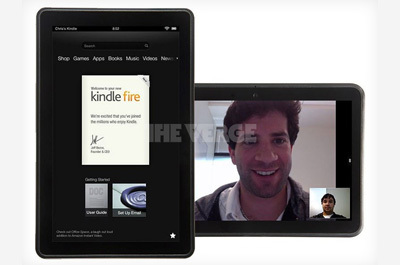 Accordingly, the Amazon Kindle Fire 2 is expected to be released on September the 6th 2012. The website The Verge presented what most probably can be interpreted as the first picture of the second Amazon Android Tablet. But because there’s only a sparse flow of information about the Amazon Event on the 6th of September, there is a chance that Amazon will release several tablets with different screen sizes. In July, we presented a study by Kantar World Panel according to which Android managed to increase their share in almost all important markets in world in comparison to July 2011. The numbers for August have just been released supporting the general trend. Android is the main smartphone operating system in all countries of the world. According to the US magazine Techcrunch it’s smartphones with a large screen (e.g the Samsung Galaxy S 3) that widened the gap between Android and Apple’s iPhone even further. 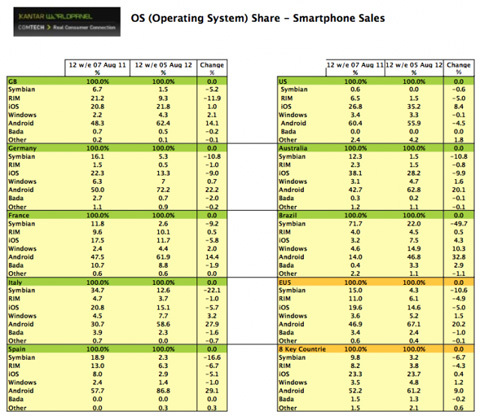 The market behavior in Europe represents a particular clue as to why Android is so dominant. The LTE wave is slowly but steadily reaching the European smartphone and tablet world. Mobile phone providers such as T-Mobile, Vodafone, or 02 are currently extending their LTE-offers. Vodafone was the first one to offer an LTE compatible phone by releasing the HTC Velocity 4G. By now competitors have managed to catch up. The Samsung Galaxy 3 S LTE for instance will be available in T-Mobile and Vodafone stores soon. It was not even two months ago when Samsung had sold 10 million Samsung Galaxy 3 devices. And now there’s reason to celebrate again: by now, so only two months later, Samsung has sold the exact double: 20 million! So in total it did not even take the Samsung Galaxy 3 100 days to reach that number. It therefore sells three times faster than the Samsung Galaxy 2 and six times faster than the Samsung Galaxy S.
At the beginning of this month, Google again released a distribution overview of Android versions installed on smartphones and tablets. As was expected, Android’s 4.0 version (Ice Cream Sandwich) has again increased its spread and is now installed on 20.9% of all Android devices. To pin point it, the increase was 5%. Android’s 4.1 version (Jelly Bean) takes up 1,2% and is expected to become more prominent within the next couple of weeks. Still dominant as always is Android’s 2.3 version (Gingerbread). With 57,5% it claims absolute majority. It will be exciting to see how long Gingerbread will be able to defend the throne. Android 2.2 (Froyo) retains 14% and is thus also still relevant. It did not take long for video game veteran Sega to establish itself in Android spheres. Its Sonic series for Android was a total hit having sold more than 100.000 units so far. Now Sega enters the race yet again with a promising adventure/strategy game called Total Battle Wars: Shogun. The game has been developed for touch screens and players need to grow resources to recruit fighting units such as archers, samurais, or ninjas. You must grow quickly however, in order to come to power and rule over all of medieval Japan. For every victory you gain extra points to upgrade your units or buildings. Total Battle Wars: Shogun features a local multiplayer mode for two players. © 2019 cayada GmbH. All rights reserved.